Try adding POLLY Scale GLOSS CLEAR (or SATIN or FLAT, depending on the desired surface finish) to POLLY Scale paint to improve airbrushing control. 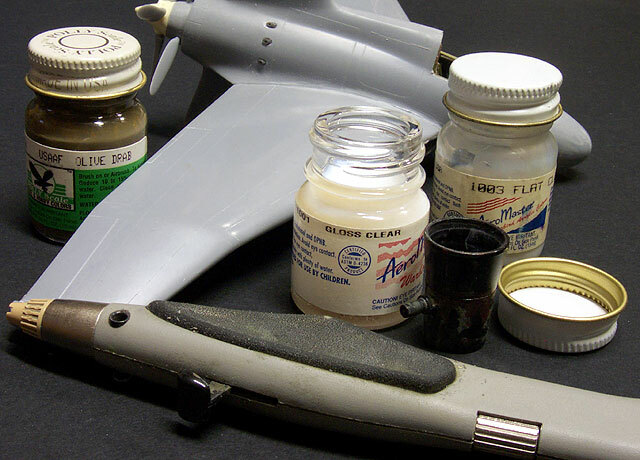 Adding clear finish restores and reinforces the resin binder, improving airbrush application. I personally prefer adding gloss as this eliminates the requirement for an overall gloss coat after the colors have been applied to the model. Mix POLLY Scale paint and the preferred clear finish at a 1:1 ratio. Add a drop or two of detergent/water mix to each color cup to improve flow through the nozzle. Set the nozzle of your airbrush to a small opening and select around 20-25 psi air pressure on your compressor. The coats should be applied thinly and the color will build up gradually, but the mixture sprays beautifully with superb control and minimal clogging. Use a hair dryer on low heat to "force dry" each coat to a rock-hard finish. This step also eliminates "pull-up" masking problems. The surface may immediately be lightly but vigorously buffed with a scrap of lint-free cotton (for example - an old pillow case, tee-shirt or tack cloth). Any leftover fuzz or threads can be removed with a tack-cloth between coats. When the paint is thoroughly cured (usually in an hour or two), polish the surface with extremely fine grit sanding sticks or paper (1200 and 2400 grit). Using GLOSS CLEAR as the thinning medium will deliver a "12-inch-deep" finish resistant to all decal softening agents known to humanity. The result of using this technique should be an extremely deep, life-like gloss. This technique works equally well with POLLY Scale METALLINE acrylics for realistic, non-toxic metallic finishes too. Just shade along panel lines with sepia and gray washes for weathered effects. Most importantly, this technique permits fast painting. Great for instant painting gratification! And remember that these paints are certifiably non-toxic. Your health is important!